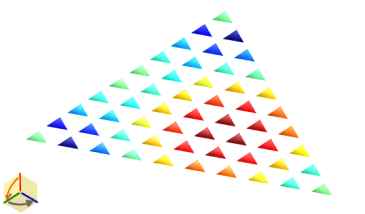 An example of a customised triangular array distribution. The number of elements and the inter-element spacing in the x- and y-direction, respectively. 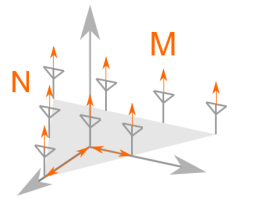 The excitation taper can be selected between equal excitation [Uniform], uniform side lobe level [Dolph-Chebychev] and first few side lobes uniform [Villeneuve]. The side lobe level and number of side lobes (where applicable) can then be set. The excitation per element is the product of two linear array excitations, one laid out along the x-axis and the other laid out along the y-axis for a rectangular array. From this excitation distribution a subset for the triangular array is extracted. It is important to note that the side-lobe specification is not guaranteed, since the layout is not adjusted to achieve these goals.